AHM's August 1977 price listing has $44.98 for the 0-6-0 offering. AHM also lists a Super Detailing Kit 0-6-0 (No.5141-DK), but no price or specific part listing is provided for this item. 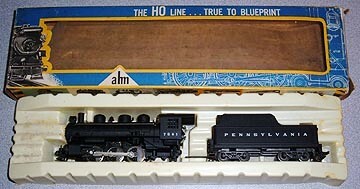 AHM's Deluxe offering was their 0-6-0 with the Super Detailing Kit 0-6-0 (No.5141-DK) factory installed and the paint schemes were enhanced compared to the standard issue 0-6-0 models. The Deluxe 0-6-0 was issued in the mid/late 1970s.